Dowth the Fairy Mound of Darkness is about the same size as Newgrange and Knowth and was built in the same period over 5000 years ago. 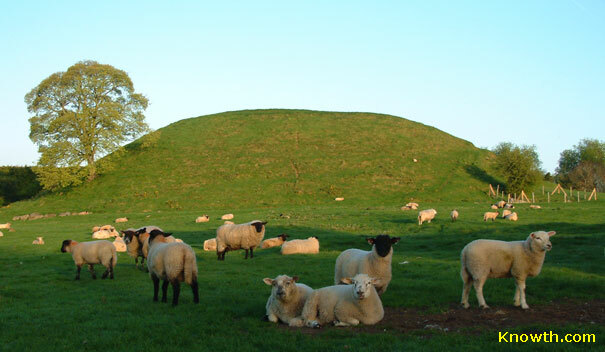 The mound was subjected to a very unprofessional excavation in 1847, two passage tombs were discovered but the mound was severely damaged in the process. The passage tombs are much less spectacular than Newgrange or Knowth with shorter passages and lower roofs. Both are on the western side of the mound, they are referred to as Dowth North and Dowth South. The Dowth North passage is 14 metres in length; the chamber is cruciform in shape with an annex off the right hand recess, the chamber roof is corbelled and is 3 metres high. The Dowth South passage is only 3.5 metres in length with a simple circular chamber and a single recess to the right; the original roof collapsed long ago and has been replaced by a concrete roof. Dowth South is aligned to the setting sun of the winter solstice; the setting sun illuminates the passage and chamber from about 2pm to 4pm on the days around the winter solstice. accessed through the Brú na Bóinne Visitor Centre located on the south bank of the river. Visitors to Dowth can drive directly to the site on the north bank of the river, a couple of miles from the Slane to Drogheda road. There is no public access to the two passage chambers at Dowth; however visitors will be rewarded with a real sense of a spiritual connection to this ancient site as they ramble around the usually peaceful mound. Anne-Marie Moroney has been observing winter sunsets at Dowth since 1997. From the beginning of October to the end of February the sun sends its rays from the south-west into the chamber. As the sun appears progressively lower in the sky towards the winter solstice, the beam travels first over the sill stone, then enters the chamber and finally shines directly onto the stones at the back of the chamber. Flythrough of laser scan survey at Dowth Megalithic Passage Tomb. Dowth from Mythical Ireland by Anthony Murphy. 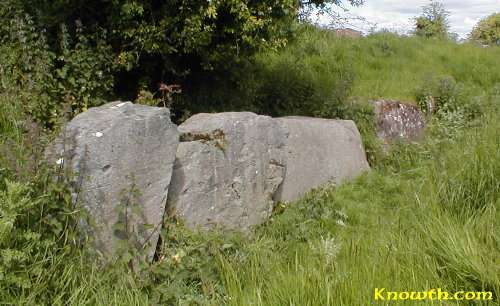 The sun symbols on Kerbstone 51 at Dowth are similar to those on the backstone of Cairn T at Loughcrew. The seven sun symbols must surely have an astronomical or calendrical purpose. Beltaine Sunrise - images of Dowth K51, the seven suns stone. Dowth from The Sacred Island by Martin Byrne an Artist and Tour Guide based in South County Sligo, in North-west of Ireland. Ireland in prehistory - Early Ireland, Megalithic Ireland, Ancient Ireland - Outside Influences. An anthropological lens applied to the early settlers of the Boyne Valley, adapted from a lecture by Dr. Gabriel J.Byrne. Messages from the Monuments - How Neolithic Monuments Communicate About Religion and Status by Paul K. Wason.